The winners of 5 e-books from me here at Healing Cuisine are: Nick P., Hannah B., Angela M., Kelly, and Carrie. Congrats you guys! Hope you are enjoying the new recipes! In the mean time, I am starting a SALE today through December 31, 2012 on my Season’s Eatings holiday e-cookbook! Regularly $13.95, you can now purchase it for just $9.99! Download your copy here! We’ve got an awesome giveaway package from Nutiva today! As you may recall from many posts in the past, Nutiva is one of my favorite sources for coconut oil. I buy it by the gallon! I also use Nutiva as my #1 source for cold pressed organic hemp oil, organic chia seeds, organic hemp seeds, organic hemp protein powder, and organic coconut butter. Nutiva is a California-based company founded by John Roulac, and dedicated to producing wholesome, organic and nutritious hemp foods, coconut oil and chia seeds. I love Nutiva because it is a company you can trust. They produce certified organic AND non-GMO products. And, they publicly fight for mandatory labeling of GMO products, which is a personal issue for me. I LOVE that they are bravely taking a public and monetary stand for the better health of all of us! Nutiva takes such care to produce the purest of ingredients, and all of their products go to show for it! I encourage you to give any of their products a try and be impressed with the taste, quality, and texture. You won’t be disappointed! Join Nutiva’s Facebook page and take advantage of a $10 off coupon! 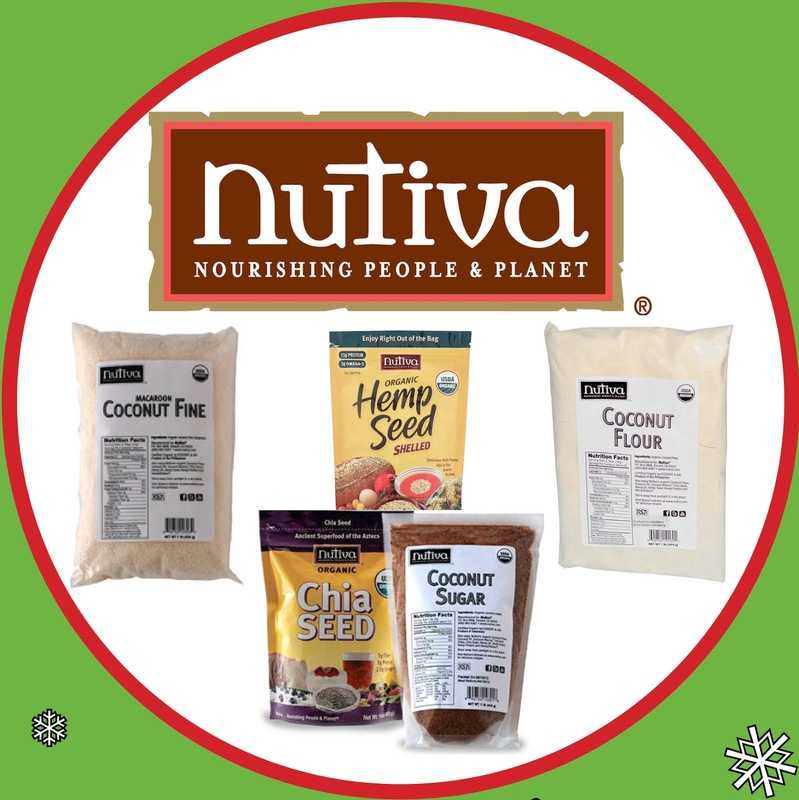 For Day 7′s Christmas Giveaway, Nutiva has graciously donated a 5 Piece Baker’s Package, including: Chia Seeds, Coconut Sugar, Coconut Flour, Coconut Fine (desiccated coconut), and Hemp Seeds. You’ll be able to bake up some delicious holiday cookies and pies with these whole food ingredients! Enter to win the Baker’s Package (chia seeds, coconut sugar, coconut flour, coconut fine, and hemp seeds)! This giveaway will last 24 hours, from midnight EST on Thursday December 6th until 11:59pm EST the same day. Entering is easy! Simply follow the various options below in the Rafflecopter widget window. This Nutiva brand giveaway is open to continental U.S.A. residents only. There will be one winner. The winner will be contacted and confirmed within 48 hours after the giveaway ends. All entries are verified via Rafflecopter. Product Review: Seventh Generation & GIVEAWAY!! corn cob pipe and a button nose with 2 eyes made out of coal! one of my favorites as a kid! He had a corn cob pipe and a button nose!